As it is coming to winter and our sneakers are heading back to there boxes away from the wether, we at the stockroom always go back to our classic Clarks desert boots the choice for off-duty Eighth Army officers. Every now and then you get a collaboration with Clark’s and it never seems to be a head turner, but this year there is something different. 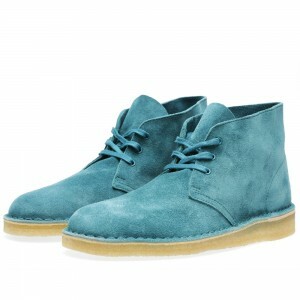 Concept x Clarks desert palmer it comes in two colours burgundy and teal. If you know about the original desert boot you will know that there are 3 eyes appose to 2, the tag with the concept logo and what we can’t get enough off is the Clarks Desert Trek crepe sole. The italian suede and matching waxed laces are perfect winter shoes.